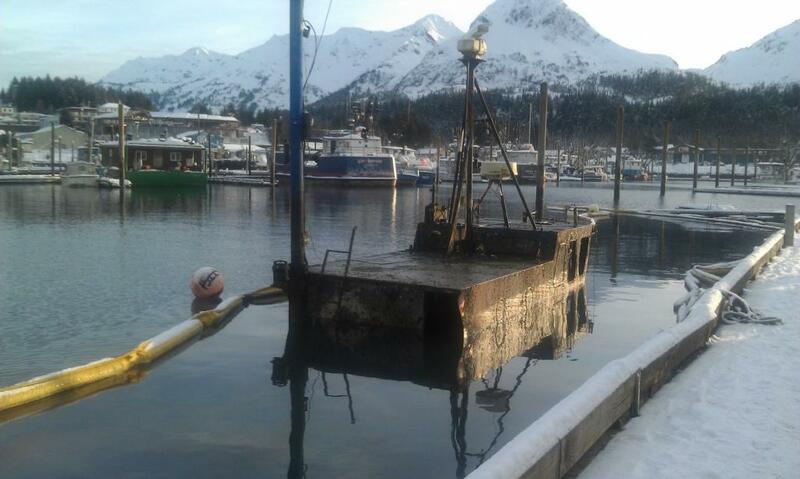 Lift Bags Raise Sound Developer Derelict - Global Diving & Salvage, Inc. Removing derelicts is nothing new to the Global team, but sometimes the situation requires an outside-the-box solution. The Sound Developer was an ex-US Navy landing craft that was 132 feet long overall, with a beam of 29 feet and a draft of 5 feet. After a number of years of service, the vessel was sold at a government auction and the ship passed through several owners before falling into neglect. 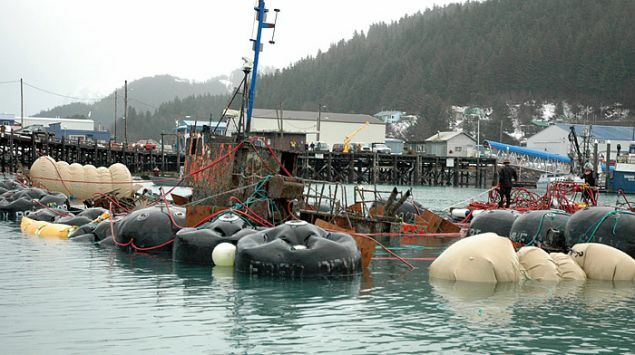 Ultimately the derelict sank at her moorings in the harbor at Cordova, AK in August 2009. Shortly after the Sound Developer sank, the US Coast Guard activated Global through their established Basic Ordering Agreement (BOA). Global mobilized resources to Cordova, where they mitigated the pollution threat by removing oil filled containers, batteries and other hazardous materials. After a lengthy 2-year process, the USCG received approval to have a contractor refloat the vessel, transport it to shore and deliver it to the City of Cordova for dismantling and disposal. Upon receipt of approval, the USCG solicited bids. Global was contracted to remove the pollution and navigation threat from the harbor, move it to an area onshore outside of the harbor, and decontaminate the vessel removing all environmental hazards. Due to the remoteness of the location, no heavy lift assets were available. A plan was developed to utilize lift bags to raise the vessel, then secure it for the short tow out of the harbor to the designated shore position. Divers secured a total of 31 lift bags to raise the vessel: (24) 9-ton bags; (5) 5-ton bags and (2) 22-ton bags. 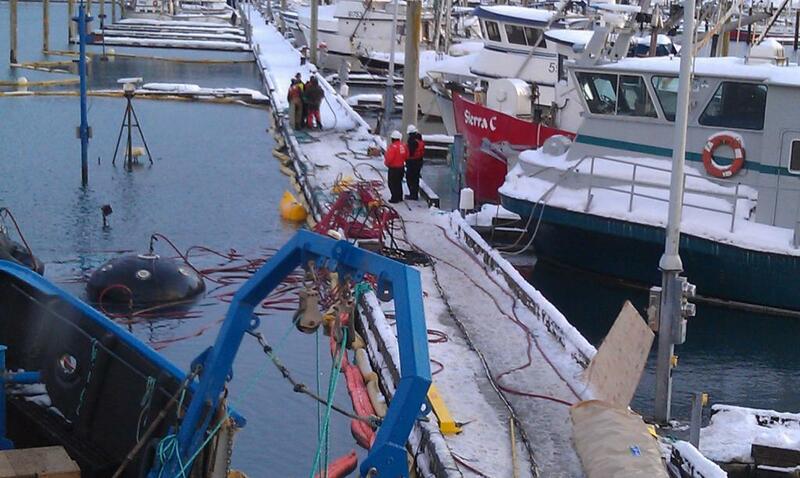 The lift bags were strategically placed and secured to the hull. All the lift bags were connected to a manifold, from which all inflation and deflation operations were carried out under the supervision and direction of the salvage master. Once afloat, the bags were further secured to the vessel and made ready for the open water tow to the beaching area outside the harbor. The vessel was placed aground at high tide and was shifted further ashore through subsequent tide cycles. The operation was timed to coincide with the highest tides of the season to ensure the vessel would be brought on shore as high up the beach as possible. This phase of the operation was complicated by extremely challenging weather conditions that impacted the schedule and the work conditions. Once the Sound Developer was safely secured on shore, Global conducted further cleaning and decontamination. The vessel was inspected and cleared by US Coast Guard personnel, and custody of the vessel was transferred to the City of Cordova.